Despite how well you take care of yourself, there are certain issues, such as cellulite and sagging skin, that appear more prominently as skin ages. These areas can be incredibly frustrating, as well as embarrassing. Fortunately, breakthroughs in science are allowing us to combat the visible signs of aging, lifestyle and environment and helping us maintain a healthy, more youthful appearance. A consistent skin care routine is an essential component to improving and maintaining the health, feel, and appearance of skin. Choosing products that contain the correct combinations of high-quality ingredients will maximize your visible results and help you regain the smoother, tighter skin you desire. SkinCeuticals Body Tightening Concentrate is a cutting-edge at-home treatment regimen that was developed to target gravity-fighting body zones including the abdomen, buttocks, thighs, knees and upper arms. 2.5% Tripeptides – Stimulates hyaluronic acid to fill skin with volume and improves collagen co-factors to support the skin’s structure. 5% Yeast Extract – Increases GAG synthesis to reinflate skin and alleviate crepiness. Formulated for loose, sagging skin, the cooling fluid contains tripeptides, yeast extract, and hydrolyzed rice protein; a combination that helps skin feel firm and reinflates and helps support skin’s structure resulting in the appearance of a smooth, tight surface. Body Tightening Concentrate can be used alone or as the perfect complement to radiofrequency body tightening or sculpting procedures to enhance lifting, firming, and tightening action and smooths skin’s texture. 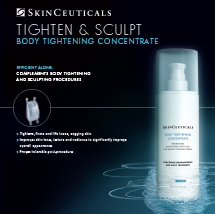 Call Dr. Shapiro’s office (480) 451-1700 for more information on SkinCeuticals Body Tightening Concentrate.